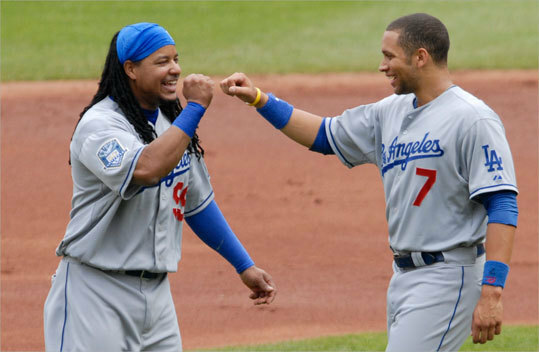 (AP) Manny Ramirez (left) greets teammate James Loney after the end of the first inning during the Dodgers game against the Cardinals on Thursday, Aug. 7, 2008, in St. Louis. LOS ANGELES - Manny Mania is all the rage in Southern California. Manny Ramírez is crushing the ball. He says he wants to finish his career in California. The Dodgers are getting ready to market Manny caps complete with dreadlocks. The local media love Manny. Agent Scott Boras is smiling. It's enough to make a Red Sox fan's blood boil. Manny is hitting .565 (13 for 23) with four home runs and nine RBIs in six games since being traded by the Red Sox. He initially said he was going to cut his hair, but that seems unlikely now. When the Dodgers return home next week, fans will be able to purchase brown and/or blue dreadlocks from stadium stores. The team will also sell blue skull caps and Dodger caps with sewn-in dreads. It's the Full Manny. "He's kind of brought a new life to our team," Dodgers catcher Russell Martin told the Los Angeles Times. "Everybody on the bench is looser and having more fun." Gee, that must make Jason Varitek, Mike Lowell, and David Ortiz feel just swell. The Dodgers sold out Manny's first two home games, including record walk-up sales after the trade was announced last week. Manny got ovations for hitting foul balls and came out of the dugout for a couple of curtain calls. A lot of fans even stayed for the ninth inning. The Dodgers sold more than $125,000 worth of Manny jerseys before hitting the road. These are the same people who previously knew No. 99 only as Barbara Feldon or Anne Hathaway. Resident media wiseguy T.J. Simers reported that Manny twice asked the columnist to sit on his lap when Simers came around the clubhouse last weekend. T.J. and Joe Torre have a friendly bet (loser donates to charity) regarding whether Manny will cut the hair before the next homestand. ESPN's Jim Rome? Reporting "live from Los Angeles," Rome said Man-Ram coming to SoCal might be the happiest moment of his life, other than his wedding day and when his children were born. The network's poll of memorable images from the past week put Manny's opening press conference photo at No. 1 - ahead of all the Brett Favre stuff. Boras said, "I was here for Fernando [Valenzuela] Mania. Manny could be something special here. He's got a dynamic personality and says things that have appeal. He can be energizing. The fans here love him." Feeling a little duped, Red Sox Nation? Still wondering if this whole thing was on the level? You are not alone. The commissioner's office is investigating the circumstances of Manny's final hours with the Red Sox. The Globe has learned (from a source with direct knowledge of the inquiry) that Bud Selig directed Major League Baseball executive vice president Rob Manfred to contact all parties for an explanation of how things unfolded around last week's trading deadline. According to the source, Manfred has yet to report back to the commissioner. The Red Sox had an option to retain Ramírez in 2009 for $20 million. They had the same option for 2010. Ramírez, who will turn 37 next season, wanted to be a free agent at the end of this season. His agent wanted the same thing. Boras inherited Ramírez's old contract and stood to earn nothing until Manny signed a new one. It was in the interest of the player and the agent to have the options dropped. Manny's only leverage was withholding services and playing at half speed. So that's what he did. Sitting out games against Seattle and the Yankees, jogging down the first base line (and maybe even looking at those three strikes against Mariano Rivera), he sent the message that he wanted out. He made sure the Sox knew he could not be trusted to play hard if they kept him until the end of the season with the options intact. After the trade, the Globe reported that Boras called the Sox and said Manny would stay and play hard for the rest of this year if the club merely dropped the options. "In no way did I make a call regarding having the trade intervened with," said Boras. "My job is to do what is best for my client. It was Boston's decision to trade him. He had the ability to control where he played. He wanted his living environment to be a place where he and his family were as comfortable as they were in Cleveland." The Sox remain conspicuously quiet, ever careful not to offend Boras, who represents several other Boston players, including J.D. Drew and Varitek (a free agent at the end of this season). The Manny trade puts a lot of pressure on Messrs. Henry, Werner, Lucchino, and Epstein - not to mention the Boston ballplayers. If the Sox fail to make the playoffs, Theo and the Trio will be accused of letting their emotions get the better of their good sense. Meanwhile, Ortiz looks for something to hit. The Dodgers are in San Francisco this weekend, then return home to start selling the Manny wigs Monday night. I've already got mine. A little souvenir from a week in Los Angeles, watching Manny Ramírez take over the town.